I really appreciate all of the fine submissions for this edition of the All About Dog Training blog carnival. Since the NaturalDogBlog is totally focused on dog training, I'm often looking around the blogosphere for other dog trainers to see what they're talking about. While there are a lot of other dog-oriented sites out there, there actually aren't too many blogs that have a strong training component - with usable advice. If you happen to come across a good one, please either let them know about this carnival so they can participate - or let me know, so I can harass contact the blogger directly for submissions. Let the carnival begin! Karen Shanley, the "Author Mom with Dogs", presents Training "Quiet" the Brilliant Aussie Way. It's an amusing tale of using time-outs to keep a dog quiet when she's lying next to the dinner table - with a surprise ending. Karen's blog does cover more than dog training, so check out the slice-of-life articles as well. They're always a good read. Lee Charles Kelley, whose "Kelley Method" was inspired by Kevin Behan's Natural Dog Training, presents another really well-written article: Using Praise as a Correction. You might think that when your dog does something you don't want them to do you should "scold" them, or correct them? Maybe not all the time - but you might scold your dog in an OBVIOUS moment, like when your dog scavenges a chicken breast at the local park, right? NOT SO FAST!!!! Lee Charles Kelley discusses why PRAISE is actually your best choice in these situations, how praise can function as a way to "correct" your dog, and some thoughts about the mechanism actually at work. Your best choice is always to build the relationship between you and your dog - while scolding often just produces resistance between the two of you. I think you'll find this article to be a fascinating read. Finally, at DoggieWoggie, Pat Doyle presents some thoughts on How to Walk Your Dog with No Pulling on the Leash, a subject near and dear to our hearts here on the NaturalDogBlog. If you think you've tried everything, and you still have pulling problems, check out Pat's article - as there may be some simple techniques that you've overlooked. I especially agree with her that you should remain calm during these moments - if anything remember that you're trying to be prey-like, which will encourage your dog to keep their attention (and walking) focused on wherever you're leading. Here at the NaturalDogBlog, we've just recently covered Part One of our series on using a box to teach Sit, Down, and Stay. While many of our articles so far have been focused on solving problem behaviors in our dogs (especially aggression), this article addresses how to use Natural Dog Training to teach your dog essential "obedience" lessons when they're in an energized emotional state - which is ultimately when you'll need them to be their MOST obedient. Also, make sure you keep an eye on the Categories list here at the NaturalDogBlog - I will soon be creating some more "functional" categories (I mean, really, what was I thinking by having a "Dog Training" category?!?!?!?) to help you navigate the site. 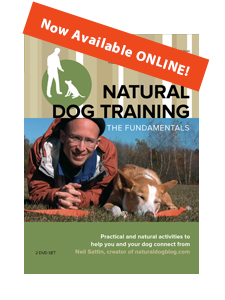 In the meantime, if you're looking for a more methodical do-this-then-do-that approach to Natural Dog Training, please refer to the Learn the Basics of Natural Dog Training page. Thanks again to all of the participants in this edition of the All About Dog Training blog carnival. Please visit their sites, show them some love, and, if you get the chance, tell them that the NaturalDogBlog sent you. And don't forget to submit your dog training article to the next edition of the all about dog training blog carnival. Take care! Neil, thanks for hosting and taking the time to summarize each post. Some good reading here! Thanks for letting me part of the carnival. I think you should know, I've been sending a lot of people to your site for the articles on tug and the pushing exercise. Karen and Lee - my pleasure, as always! Karen - I've definitely been seeing some visitors who are coming from your site, so thank you so much for the link. Hopefully some more is coming your way as a result of these carnivals as well. Lee - I appreciate the referrals. Between the two of us (and the growing community of Natural Dog Trainers), I'd like to think that we're giving people enough info to find some success with this "new" method. My box training post refers people to your Trick-or-Treat article as well, so hopefully you're getting some traffic from that too.